There has been a lot of excitement about the first glimpses of the martian arctic returned by the Phoenix lander, and particularly lots of “oohs” and “ahhs” over pictures, like the one above of so-called “polygons” on the surface. So, what’s the big deal with these polygons and how do they form? Why is this a big deal for the Phoenix mission? 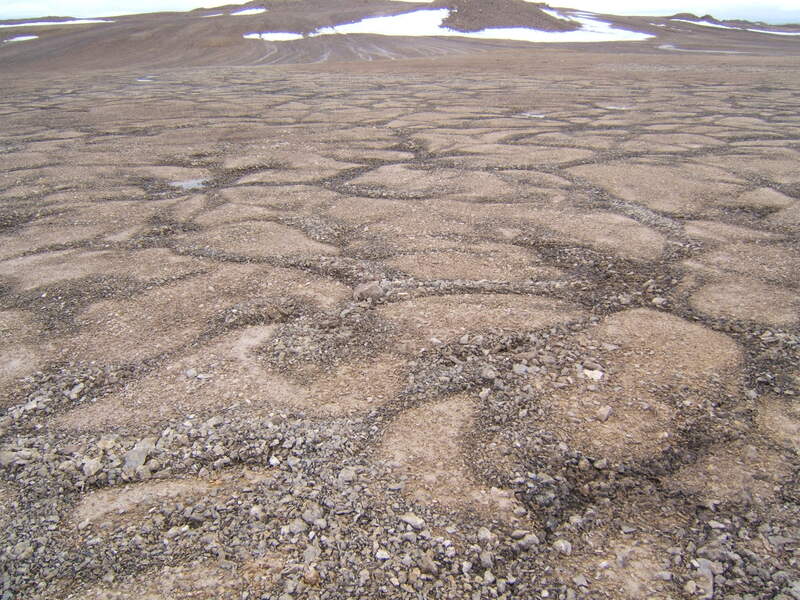 Well, the primary goal of the mission is to dig up some ice and analyze it, and patterned ground such as the polygons observed at the landing site is a very good indicator that there have been freeze-thaw cycles and that the soil has ice in it. What is weird to me is that the polygons at the Phoenix site don’t seem to have the rocks sorted by size. I see equally large rocks in the middle of the polygons and at the edges. Still, there is no mistaking the patterns at the site. My first, gut instinct explanation of the lack of sorting is that the patterned ground formed a very very long time ago, perhaps billions of years. Since then, there have been impacts nearby (notably, a very large crater just to the east of the landing site) that have scattered rocks of all sizes over the surface. So maybe the rocks just under the surface layer are sorted, but they are covered by ejecta that has not had time to be sorted. That’s just my hypothesis: hopefully we’ll see if I’m right when Phoenix starts digging! This entry was posted on May 27, 2008 at 4:17 am and is filed under Phoenix, Pictures, Water on Mars. You can subscribe via RSS 2.0 feed to this post's comments. Both comments and pings are currently closed. Ejecta sounds good, but I wonder whether itmight be simpler? Perhaps, in the last few Gyr there haven’t been enough times when the temperature was high enough to penetrate into the ground and thaw the ice? Do we have any terrestrial examples of these polygons that have only started forming recently and are only partly sorted? Thawing the ice would not “un-sort” the polygons though. The fact that there are polygons is evidence of freezing and thawing, though it’s anyones guess how long ago they formed on Mars. Mars has a habit of showing us things that look familiar, but are vastly older than their Earth counterparts.